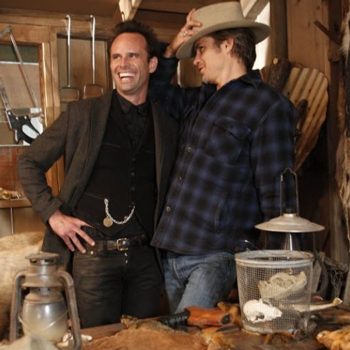 I'm over at Heroes & Heartbreakers today 'shipping about Justified's Raylan and Boyd. Because really? What is sexier than a two men with extensive vocabularies? Not a whole lot. Says me. These two guys just need to stop playing around and admit that the chemistry they have together is way hotter than the chemistry they have with any of the women on the show. Head on over to read all about 'em, and look at more yummy, yummy pictures.